We are happy to explain all details concerning your stay at A&O! If you still have any questions that you feel we have not fully answered yet, feel free to contact us! a&o offers its own free app for guests in German and English. It shows you the daily online prices of each hotel, a picture gallery with hotel information, contact options, access assistance and a map. Of course, you can book directly through the app. Available for free here: Google Play Store; Apple App Store. As soon as you check-in to our a&o and open the app, the hotel and surrounding area will be recognized and you will be able to use the intelligent online travel guide. The hot spot search near your location will show you useful information about the city you are visiting, including phone numbers of taxis, tourist information offices, opening hours of the attractions, assistance with the use of public transport and important emergency numbers on the spot. Guests with a FIX booking (cheaper rate; paid in advance) can arrive at any time without hesitation. Guests with a FLEX booking (payable on site; can be cancelled free of charge by 6 pm) should call us on +49 30 80 947 5110 and have their booking guaranteed by submitting their credit card details with CS Service Agent to be on the safe side. Then you can arrive later without any problems. The credit card is for security purposes only – you can still pay on arrival. The card will only be charged if you do not arrive. Without a credit card, we cannot guarantee that your room will be available after 6 pm. There are bus parking spaces free of charge in close vicinity. Some a&o's offer bus parking spaces. Almost every a&o location has its own parking lot or underground parking. Street-level spaces cost from 5,-€ per day. For groups of 10 or more we also offer dinner (upon request). We can also provide you with packed lunch for 6 EUR (groups from 10 people get a 50ct discount). It contains a sandwich, fruit, a snack bar and a drink. More information here. Check-in is possible at any time. Your room is ready for you at 3pm. Check-out workdays is until 10am. Weekends and also holidays until 11am. Yes, these offer ample space for smaller and medium-sized groups. Should the room still be too small we can make the dining area available (non-eating times only). For teachers and accompanying persons there is also a teacher and guide lounge, called a&o Lounge. With our Early Check-in for 10€ you can enter your room at 11 a.m. On Weekends at 12 a.m. - You can book this service for single, double or family rooms at aohostels.com. The Late Check-out until 2 p.m. for 10 Euro allows you a nice and long sleep-in. Available also online. A precise description of the directions can be found on each location's website. In some a&o cities a so-called ‘culture tax’ (accommodation tax) is charged on visitors. The tax is either based on the net sum paid by each person per night or is simply a sum added to your overnight stay. For your comfort, the tax is never included in your accommodation because it might be possible that you are excluded from it. In Amsterdam, all tourists pay 5% on the net price of your accommodation. Read more about the “Toeristenbelasting” regulation here. 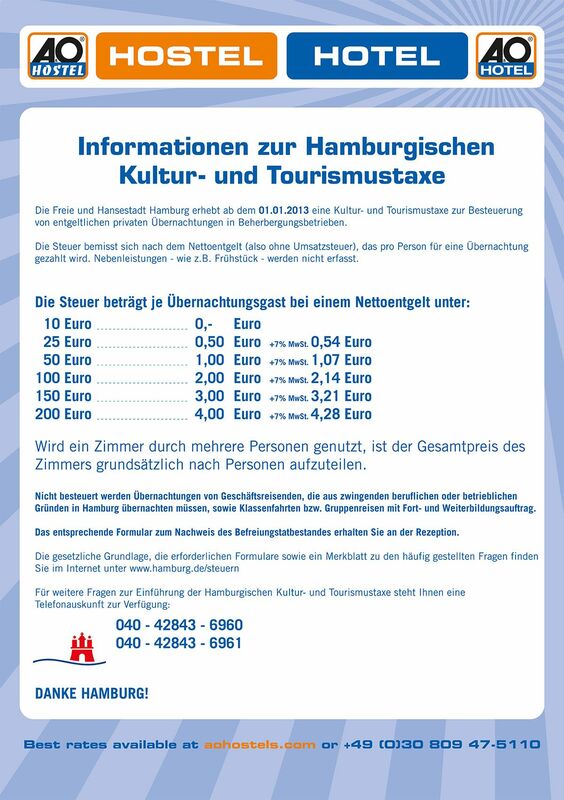 All guests older than 18 years pay a tourist tax of € 2,00 per day (including 7% value added tax) to the city of Bremen. Exempted are freelancers and employees who are staying for business purposes. The exemption forms can be found below. Guests staying longer than 7 nights in a row are also tax-free from the 8th day on. All guests pay 1.50 € local tax per day. Groups of students up to the age of 15 and people staying for more than two weeks due to a business purpose are freed. Please indicate the reason that applies in a respective form. In Venice tourists pay the "tassa soggiorno", a residence tax for tourists who stay overnight, depending on the high or low season and the type and location of the accommodation. A&O Venice Mestre is a "Foresterie per Turisti" accommodation on the mainland. This means, that in the main season (1 February - 31 December) you pay only 1.40 € per person and night (all 16 years and older). In the low season (month of January) it is 1 € per person and night. Children up to 10 years of age are excluded. For 11 to 15 year olds there is a 50% discount. So, young people pay 0.70 € per person and night (except in January: only 0.50 €). From the 6th night onwards the tax is omitted. People with disabilities or impairments are tax-free. Important for group travel: Per 25 travellers one bus driver or teacher will not be charged with the tax. There are some more exceptions that allow you to refuse the tax payment. Please read if one of the following things is applicable and fill out this form, if so. - bus driver and travel guide (from travel agency) from a tour group of at least 25 persons - all bus drivers and 1 travel guide per 25 Pax. Special rules for Salzburg: For a stay of more than 2 weeks you won’t have to pay the tax. Please bring along a confirmation of the longer period of stay. Dortmund: Your employer’s document stating your business event will guarantee your exemption from the city tax (name of the guest, period of the officially arranged trip with arrival and departure date, business reason). You can store your luggage in our lockers. For groups there is also a free luggage room. Dogs are always welcome at all a&o locations! You can bring a maximum of 2 dogs in your room for a fee of 5€ per night and dog. Unfortunately it is not possible to bring dogs into the multi-bed rooms, as it is possible that it would make other guests uncomfortable. For the same reason we ask you not to bring dogs to the breakfast room. We appreciate your understanding. In almost all of our a&o establishments, you can find single, double and family rooms, however you can also book a bed in a dorm for four to eight people. You are booking a private room i.e. a single, double, or family room. The price includes bed linen, hand towels, 2-in-1 shampoo, a hairdryer, and you can enjoy the convenience of your own bathroom. You are booking a bed in a dorm room. This option offers you affordable accommodation in an uncomplicated atmosphere. With this option, each room has its own bathroom with 2-in-1 shampoo and a hairdryer. You can also add bed linen and hand towels to your booking. You can find them on the backside of the room door or in the footer section of our website ("GTC"). You can of course also bring your own food when staying with us. Our tip: It is best to check in advance whether the a&o you have booked offers a guest kitchen where you can prepare your meals. You can find out either by reading the e-mail sent to you 48 hours prior to your arrival or by checking our website here. If you are already on-site, please ask at the reception for selected tickets. Our friendly staff will be happy to help you. Of course, you can already book selected tickets on our website upon your arrival. Simply choose an a&o city and get some inspiration. For example we offer WelcomeCards which already include a ticket valid for public transportation and huge benefits for several leisure and culutural activities. Every a&o offers free Wi-Fi in all public areas, such as the lobby or the bars, and in every room as well. Wheelchair-accessible rooms are available in almost all a&o HOTELS and HOSTELS. Feel free to call us at +49 30 80947 5110 to get more information. We offer community kitchens with full kitchen equipment in some cities for city dwellers, for example for solo travellers, for couples, families and friends as well as for smaller groups. More information is available here. Families find a Kids’ Corner in every a&o with toys, a painting board, coloring pencils and children's books. In some a&o's, the small children's playgrounds even have slides or playhouses. Your children can have a good time while you enjoy a cup of coffee in the lobby or in the breakfast room. Find more information about our family benefits here. We’re sorry to say that we do not offer hotel child care services. However, we can provide you with a good babysitter network for some cities that you can contact independently. iii) basic cleaning after check out. We are always striving to help the environment that's why we don't change the towels daily. Please hang them on the towel rail and do not leave them on the floor. Fresh towels can be purchased at the reception for a small fee. Since January 1, 2008 all of our locations are smoke-free. All single, double and family rooms come with bed linen and towels. Only guests in multi-bed rooms need bed linen and towels, if they didn't bring their own. You get bed linen for 3.50€ and a towel for 1.50€ either at the reception or as an online feature when booking your stay. In family rooms (grand)parents sleep a double bed (bed linen included) and their (grand)kids in one or two bunk beds. Families put fresh linen on their children's bunk beds themselves. Of course, we offer dorm rooms just for women. You can simply book them online – a pink banner shows the correct room category. All ARC Europe members (such as AA UK or AAA USA) get 12% off the daily-updated overnight rate at all a&o HOTELS und HOSTELS and a free, non-alcoholic soft drink (kids under the age of 12 get a free ice-cream). Young drivers with an ADAC membership ('Junges Portal') get 12% off and free Wi-Fi instead. All information with this reduced booking rate here. It depends on the rate you booked. If you booked using our Flex-Rate, then you can cancel at any time. Otherwise the room will be kept available for you until 6 pm on the day of your arrival. Please let us know if you will arrive later. The Fix-Rate is, as the name says, "fixed" and cannot be cancelled. The price cannot be reimbursed even if you do not stay here. That's why this rate is especially low. For groups of 10 or more there are special cancellation rules that you can find in our Terms and Conditions. Children under 18 years of age stay free of charge in their parents' room. The room price is based on the number of travelling parents (guardians). Little ones are always welcome! We can provide you with free children's beds (recommend up to the age of 2 years) and high chairs, when available. To use this discount simply click on any a&o and choose the Early Bird Benefit. You get this special rate 60 days prior to your arrival. Social media are great communication networks that we really like! This way we can interact with our (potential) guests. That's why fans of our Facebook page also get 5% off the daily-updated price. As a frequent a&o guest you get - similar to bigger airlines - a special treatment. For 69€ you can order your personal Traveller Card at each reception desk or via telephone / E-Mail. The card will be send by post (on-site you will get a temporary card). You find all advantages for you as our guest here. We don't request a deposit, but we request that groups behave themselves properly. If you stay at one of our a&o HOTELS and HOSTELS for a longer period of time, we recommend purchasing a Traveller Card. It offers exclusive prices for frequenters and other great advantages. Find more information here. When travelling with lots of people or at regular intervals, we're happy to advise individually. Our competent sales team deals with your requests at: [email protected]. You can choose from a range of payment options. You can pay by instant bank transfer, credit card (VISA or MasterCard), PayPal, Amazon Payments or direct debit. Paypal payments are charged with a 2.45 € processing fee when your amount is lower than 200 €. You should only use the direct debit option if your arrival is not in the next 5 days. Journalists get a 20% discount on overnight stays. MICE Travel Card holders also get to use this special price. Please contact [email protected] to make a reservation and show your valid press pass at the check-in counter. Our prices are determined by availability – completely fair, completely transparent! That means that if beds of one room category are in short supply at a specific date, then the prices go up. And if the desired occupancy rate has not been reached, then the prices also fall automatically. What does that mean for you? Basically, the earlier you book, the lower the price. Those who make decisions on the spur of the moment also benefit from exclusive last-minute deals – of course, only as long as the respective category is not fully booked. Each student with a valid ISIC- oder ITIC-ID card gets 10% off the daily-updated rate at all a&o HOTELS und HOSTELS including a free, non-alcoholic soft drink. Simply type in the discount code "isic" into the appropiate field when booking online. We don't have a surcharge for single occupancy. You can find our current prices on each location's website. You can purchase our "a&o TO GO blue" gift box for 119,-€ for yourself or a special occasion. The box includes 2 nights in a double room for 2 people with breakfast buffet included. Kids younger than 18 years stay overnight for free in their parents' room. A great tip for backpackers is our "a&o TO GO orange" gift box for 29,-€ that lets you sleep in dorm for 2 nights with bed linen and free Wi-Fi. Find out more here. Our Online Shop has got plenty of other useful and interesting products.